The impact of the growth of Texas’ population, economy, and energy requirements on Texas water. Along with numerous partners, the Environmental Science Institute at The Univ. of Texas at Austin is leading an effort to better understand and to address the grand challenges of water availability in Texas, for today and for the future. This effort is supported by the Cynthia and George Mitchell Foundation and the National Science Foundation. Collaboration and communication linking science and policy to advance Texas water resilience. The Texas Water Research Network provides a forum and encouragement for research about water science, management, and policy. Solutions to Texas’ water challenges will be addressed through new knowledge, innovative approaches, as well as through the synthesis of existing knowledge. This is of special significance for Texas water challenges related to the rapid population growth and projected changing water availability in the state in the 21st Century. The Leadership Team draws on the experience and expertise of established researchers and stakeholders related to Texas water resources. The Leadership Team will provide broad perspective and guidance to shape the focus and direction of the Texas Water Research Network. The Facilitation Team includes a subset of members from the Leadership Team, along with others needed to actively implement the vision outlined by the Leadership Team. Univ. of Texas at San Antonio – Lloyd Potter (College of Public Policy). The interdisciplinary project team includes faculty and researchers from multiple universities in Texas and beyond, along with stakeholders from diverse backgrounds and interests – agriculture, water policy, science and engineering, climatology, demography, urban planning, energy, decision support, socioeconomics, land use-land cover, and hydrology. An understanding of impacts on stakeholders. For more details, check out the project abstract. 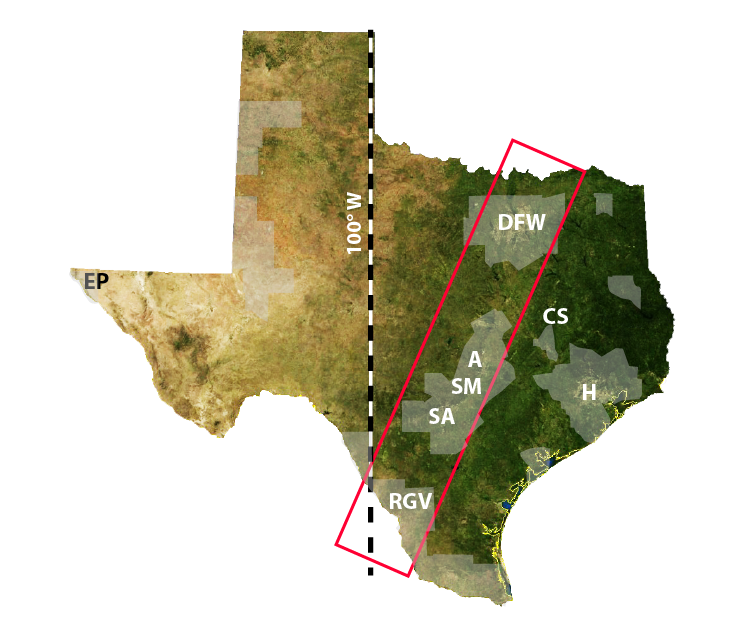 Map of Texas showing the study area outlined in red, counties with more than 50% projected population growth (2010-2050) in gray (Potter and Hoque 2013) and population centers (A, Austin; CS, College Station; DFW, Dallas-Fort Worth; EP, El Paso; H, Houston and Rio Grande Valley, RGV). The 100th Meridian (dashed line) bisects the state near the western edge of transition between the humid east and the arid west (Powell 1879). 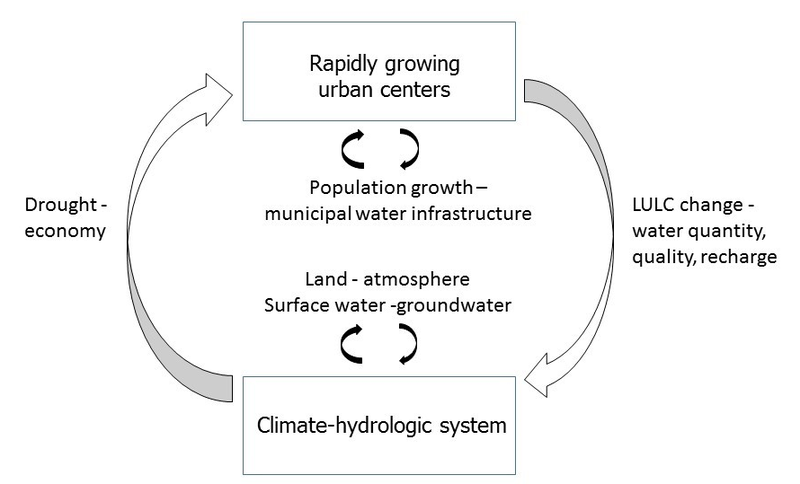 Relationship between natural system (Climate-hydrologic system) and human system (Rapidly growing urban centers), and selected examples of couplings within (solid arrows) and between (unfilled arrows) these systems. LULC = Land use – land cover.